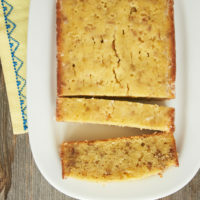 This recipe for Lemon Bread is the first post I ever shared on BoB! I’ve updated things a bit with new photos and a better written recipe and description. Enjoy! Lemon was an acquired taste for me. It took me many years to embrace it, but now I can’t get enough! 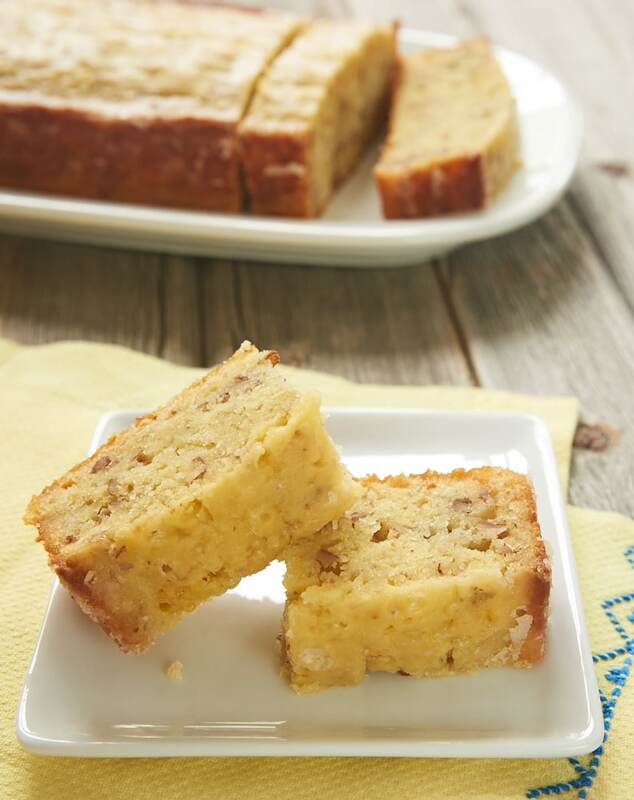 If you’re a fan of big lemon flavor, then this is the quick bread for you. In just a standard-sized loaf, there’s enough lemon to make any lemon lover’s mouth pucker! I highly recommend that you make this bread with fresh lemon juice. I confess that I keep a small bottle of lemon juice on hand for those emergency moments when I need a little bit for a recipe but don’t have any fresh lemons. But for something with this much flavor, it’s well worth making sure you have fresh lemons in your kitchen. I’ve made this bread several times over the years, and I’ve learned some things about making it that are worth noting. As far as mixing the batter and making the glaze, it’s fairly straightforward. If you’ve ever mixed traditional muffins or quick breads, then you’ll see a familiar method here. The trick to a perfect loaf, I’ve learned, is all in the pan. I think I’ve used just about every kind of loaf pan imaginable to make this bread. Metal. Stoneware. Non-stick. You name it. And each one has turned out differently. However, I consistently get great results from a light, non-reflective, anodized aluminum pan like this one. It’s a bit wider than a normal loaf pan, but I love the straight sides and the way it bakes. The bread is plenty flavorful all on its own. But that glaze! It’s such a simple combination of confectioners’ sugar and lemon juice. It soaks down into and around the bread, giving it even bigger flavor while keeping the bread nice and soft. The recipe recommends waiting 24 hours before serving. I’d say that’s not absolutely necessary, although it will get better, softer, and more flavorful the longer you can wait. The lemon flavor is really just lovely. And everyone who tried it remarked on how soft it is. It’s really quite a pleasure to eat. This is definitely a keeper recipe! Find more lemon recipes in the Recipe Index! 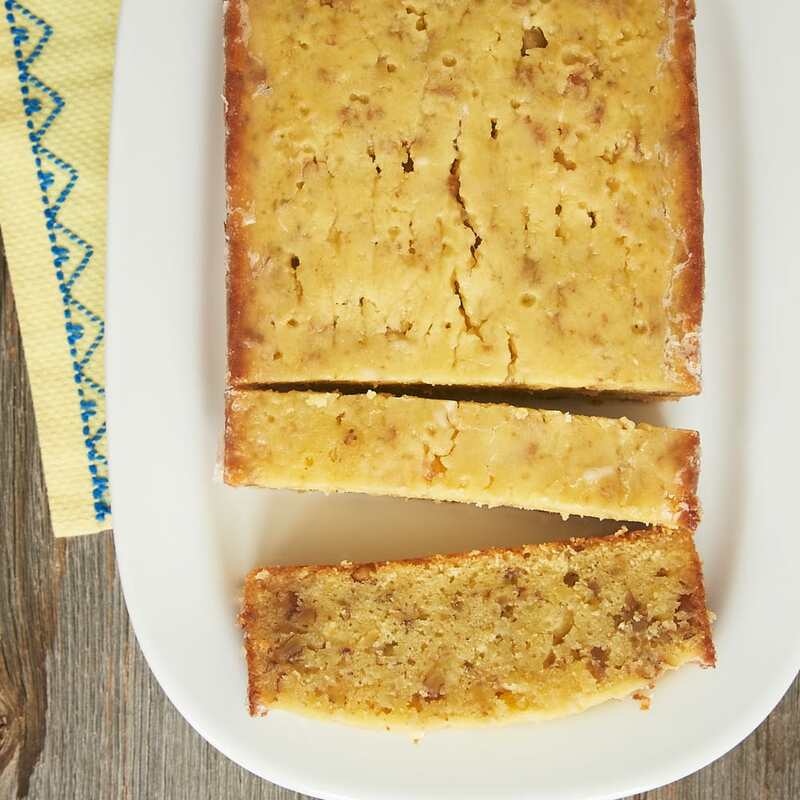 This soft, flavorful Lemon Bread is a great for breakfast, a snack, or even for dessert. A must-bake for lemon lovers! Whisk together the flour, baking powder, salt, and lemon zest in a large bowl. Set aside. In a separate bowl, combine the sugar, butter, lemon extract, and lemon juice. Add the eggs, one at a time, mixing well after each addition. Add the sugar mixture in three portions, alternating with two portions of milk. Mix just until combined. Stir in the pecans. Pour the batter into the prepared pan. Bake for 50 to 60 minutes, or until a pick inserted into the center comes out clean. Place the confectioners’ sugar and lemon juice in a saucepan. Cook over low heat until the sugar dissolves. While the bread is still warm, use a sharp knife to pierce the top of the bread in several places. Not all of the topping will go down into the bread. It’s fine if some of it stays on top or runs down the sides. Pour the topping over the bread in the pan. Allow the bread to cool in the pan for 1 hour. Remove the bread from the pan, and wrap it in foil. Leave the bread wrapped for 24 hours before serving.